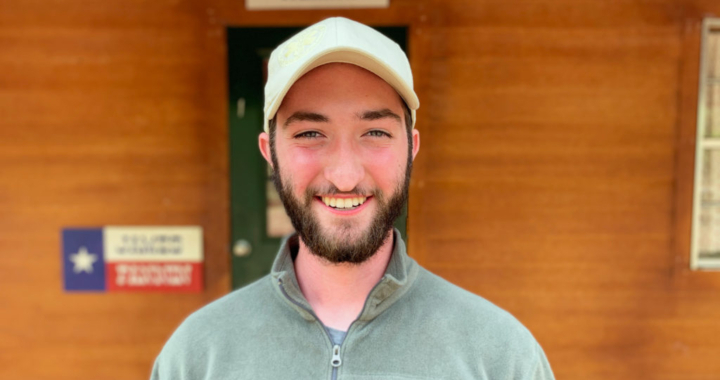 Taylor Beavers is no stranger to Frontier Camp – he served on summer staff for two summers, and was an intern in the fall of 2018. We’re very grateful to have Taylor join the FC full-time staff as the Assistant Retreat Director. But that won’t mean he’ll be a stranger during summer; you’re certain to see him playing a game with the campers, or coaching someone up the challenge course, because Taylor loves camp! Tell us a bit about yourself. I’m a 21-year-old who loves the outdoors, emergency medicine, books, taekwondo, and coffee. I grew up in North Georgia and the greater Houston area. It included fishing, kayaking, and backpacking with my 2 brothers. I did move briefly to Jackson, Wyoming to get my EMT-B and WEMT with the National Outdoor Leadership School. While I was born here and love Texas, as an outdoorsman I do really miss Georgia’s Appalachians, rivers, and really varied topography! I have two brothers, a sister, and seven awesome nieces and nephews. How did you get into camp ministry? That’s a really difficult question to answer in a few sentences. I grew up in a strong Christian family, and had wrestled with the idea of working in full-time ministry since I was very young; with the ups and downs of the semi-cliche “feeling called”: the uncertainty of knowing exactly what that meant and trying to balance that with all the other factors you consider when you’re preparing for adulthood. As I grew and matured in my faith, I realized God had given me unique skills and passions that only He knew how He would use; but I was called to pursue the open doors in front of me and allow Him to guide. In the spring of 2017, a friend recommended Frontier Camp to me as a summer job that I might enjoy and would fit me well. Working as a senior counselor that summer, I found what I loved! I returned home that fall with a much clearer idea of what I believe is why God has given me some of the specific passions that He has! I came back for summer 2018 as Adventure Challenge Manager, then as an intern that fall, and finally on full-time staff as Assistant Retreats Director this past January. It’s sometimes hard for me to feel this verse applies to me because it feels so presumptuous to tell others to literally imitate me because I’m imitating Christ. I don’t feel anywhere near the level of personal holiness to point other people to follow me. Yet Paul’s point isn’t his own sinlessness; it’s the example that he’s setting as he forges on after Christ. He’s calling people to follow him, to watch what he does and imitate it as he imitates Christ. In my role at camp, it’s easy to see it as having less of a hands-on spiritual impact since much of my job is mostly behind the scenes doing logistics and planning, and only rarely in-depth time with our weekend staff. It is an encouragement to me that discipleship doesn’t just happen in the quiet and a one-on-one conversation. It seems perhaps, even more, a reflection of the Biblical model when it happens in the chaos of hard work and crazy retreat weekends, striving to reflect Christ to those who I’m hiring and leading in my interactions with them, our guests, and our campers. What is your favorite Bible verse/passage/story? I want to protest this as an unfair question! How am I supposed to pick a favorite? I think if I had to, I would have to say it is Psalm 51. Of course, this is David’s psalm of repentance and contrition before God after his sin with Bathsheba. Knowing the story, both before and after David’s repentance, makes it such a rich, full testament to both the depths of our sin and the depths of God’s grace. I can’t read that psalm without taking time away to reflect on how great a mercy God lavishes on us through His Son! What are your hobbies/what do you like to do in your free time? I love the outdoors, so it’s pretty incredible being able to leave work at 5:00 and be fishing by 5:15! I enjoy kayaking, hiking, and backpacking. When I’m not doing any of those, there’s a decent chance you’ll find me reading. What is your favorite building/place at camp? Well… I have a connection to Fannin cabin since I have many fond memories as a counselor there; but I think I have to say the boat dock. I’m a sucker for sunsets! What is a special talent/random fact of yours? I’ve gotten to practice and compete with taekwondo since I was 13 years old. I love it! It’s taken me to some really unique places in the world like Ireland and Italy on Team USA!